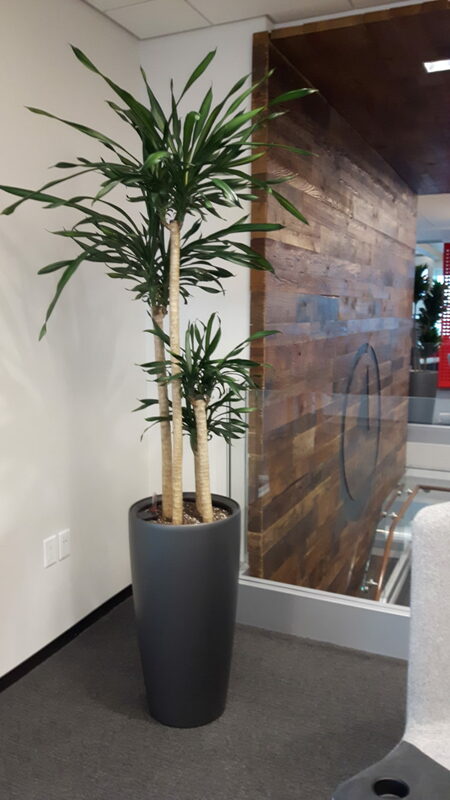 Dracaena Rikki has quickly become one of our new favourite tropical office plants. This unique looking plant has proven itself to be extremely hardy and versatile. It is great in low light, but can tolerate bright light as well. Dracaena Rikki is resistant to most common pests, and can withstand handling much better than its cousin the Corn Plant. Rikki is a relatively new cultivar of the Dracaena deremensis species. It has long, narrow arching leaves that feel like thick plastic. The leaves have varying amounts of yellow through the center. In good light, the plant will keep this coloration. In low light, it may revert back to a solid green, although the Rikki is less likely to do this than other Dracaena species. These plants are typically grown in cane form, with one head of foliage per cane. Growers will cluster 3 or more canes of varying heights in a pot for retail sale. The plants are sold at heights from 4-7ft. Rarely you may find smaller, bush forms available, without a cane. These can be floor plant size or table-top size. Dracaenas are high on the list of good air cleaning plants. This new cultivar give us more choice when selecting indoor plants for this reason. Dracaena Rikki is one of the faster growing Dracaenas. It may grow up to a foot per year in the right conditions. Our Rikkis do best when sub-irrigated. Dracaenas have root systems at the bottom of the soil ball so they easily adapt to bottom-watering. They are a very low maintenance plant, as they require very little water. It is important to not overwater any Dracaena. Allow the soil to dry out thoroughly between waterings. If you are using a sub-irrigation system of any type, do not add much water each time. If the soil becomes saturated with water, the roots will quickly rot. Fertilize Dracaena Rikki monthly from February until November with a high quality house plant fertilizer. The leaves attract dust quickly. Wipe regularly with a damp cloth. This will also remove pests before they can become a problem.